We are one of today's stops along the Silent Song Blog Tour presented by AToMR Book Tours. To see the tour list, go here. We have an excerpt and there is a tour wide giveaway of 12 books and one autographed printed book. Our review is below.Book description: The princess of the school, Alice, is keeping a secret that could strip her of her high school fame. She is obsessed with the school’s outcast, Keith, but not just him – his music. “I’m sorry,” I said when we were alone. Keith no longer stood immobile, out of place in the Victorian drawing room. He’d jumped back into the pit, unplugged the guitar, and proceeded to examine it without acknowledging my presence. “Is it broken?” I tried again. The calm in his deep voice cut worse than a slap would have. And what could I say to defend myself? He shrugged, dismissing me just like that, and turned back to his guitar. “Whatever.” As if his attitude hadn’t conveyed the feeling. I turned and headed toward the door, but for some reason my step missed its usual spring. I moved with an insecurity that I hadn’t shown—hadn’t felt—since kindergarten. 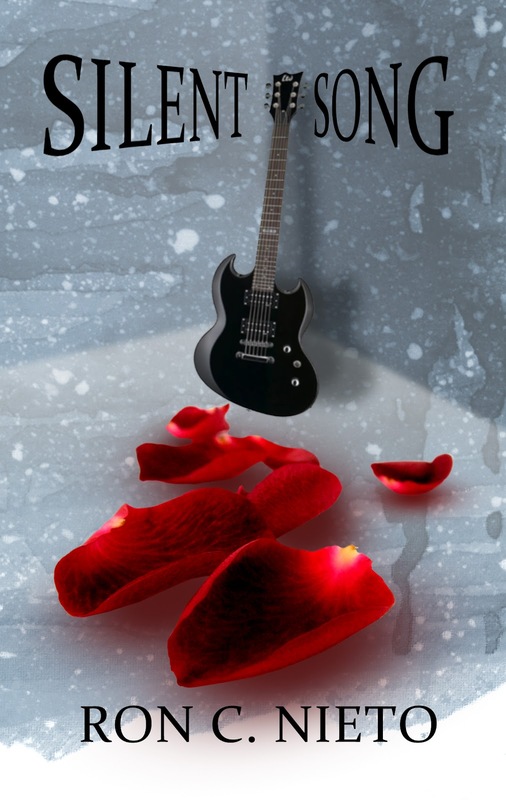 I decided to overlook the way he referred to his stupid guitar as if it were a girl with way more tenderness and admiration than he’d ever aim my way, and retraced my steps. I tried not to think of the fact that engaging Keith in conversation in public went against every social survival instinct ever. OUR REVIEW: I love reading stories where music is a primary focus, a character of sorts. I'm always interested in how authors incorporate music--either through a musician, songwriter, or even a listener--into their novels. Some feature brilliant nuances of feeling and emotion, others capture the passion or desire, especially in the descriptions. 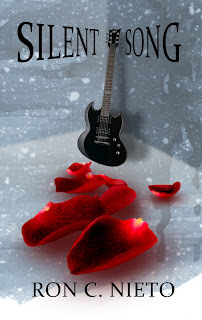 Silent Song is a YA novel about the popular girl and drama club star, Alice, falling for the resident freak, Keith, who happens to be a brilliant guitarist and author Ron C. Nieto did a nice job of bringing the complexity and layers of music together with the demands and artistry of acting and something more. I can honestly say I was really surprised by Silent Song. The author nailed the newness of first love in her gentle descriptions in her scenes between Alice and Keith. And I'm so glad this was not one of those instant-love stories. Alice already knew Keith from elementary school where they were close friends until his mom became ill and his family moved. In high school Alice is ashamed to realize the boy she used to know and like has morphed into an emo/goth kid complete with long dyed black hair and nails. The queen of popularity is a status she thought she wanted until she walks by Keith's house one day and hears him playing guitar. Since then she finds herself drawn to sneaking up behind his house to see if he's playing. I wasn't sure how I would like this--a teen in heels tramping around in the mud to hear someone strumming--and in this opening scene, I bought it. I bought everything. I understood why Alice was there and in fact I became like a shadow Alice as I practically devoured their story. Alice does A LOT of growing up in this book and so does Keith. They learn from each other and no longer care what the student body thinks of either of them. I liked the message that we shouldn't judge someone for the way they dress or look and that we can change. When Alice lets go of her preconceived notions about an emo kid being like a vampire and troublesome, she sees the guy below the long hair is the same boy she befriended years ago. Of course he had to change from whatever life threw at him over time, but he's fundamentally the same. The author really captured Alice's character and showed her through her actions, her words, and the way she looked at Keith. Keith's playing was shown convincingly and I liked how gentle he was with Alice. The scene where she thinks he will kiss her for the first time is incredibly gentle and surprising (I won't tell you what happens, you have to read the book). That is another strong part of this novel--the scenes between the two teens are so full of true genial emotion which touched me as a reader. Their dialogue and action played out in my mind so life-like I never once questioned their relationship. That's the sign of truth in writing. The author also showed us how Alice, as an actress, used Keith's soundtrack for the play she stars in as an energy source to become the character she was portraying. Using music as the medium for her muse was a unique touch and added layers to an already rich story. This story may sound simple and formulaic in theme, but it is not. Just when the reader thinks it is nothing but a love story, Nieto throws a twist at us and Silent Song becomes something more. I won't spoil the surprise but I will say if love stories featuring real characters, music, theatre, and a cute cat, Silent Song is the book for you. Ron C. Nieto's debut novel is endearing and YA fans should experience Silent Song for themselves. Rating: **** I really enjoyed it. Cover comment: Not a fan of this cover. Would like to see a redesign. About the author: Ron C. Nieto is a fantasy and romance author who has been writing in her secluded fortress for the longest time. Recently, she had a talk with her cat and decided that she should share her creations, because it was selfish to hoard them all for herself, and so Silent Song was born as her debut novel. There will be 12 ebooks given away on the tour plus one signed print copy. All are open Internationally. Yay! You noticed and commented on Sparrow! I love that cat, really. And you're the first to note him, so I'm extra happy. Of course, I'm also really glad to hear you enjoyed the story so much! I like the petals on the cover. The splash of red is great. It sounds interesting.